Looking for that unique experience with firearms or self-defense training? What about a corporate meeting where you need someone to come in and give a training program about what to do in the event of an active shooter, or teach about situational awareness? Defender Training Academy is your answer, our team of highly qualified instructors can put together custom training programs, seminars or courses to fit your specific needs. We pride our ourself in providing the first class customer service and attention to detail you have come to expect from Defender Outdoors and apply it across any of our custom built training programs. Whether the training is held at our facility or at yours we are more than happy to work with you on fulfilling your self-defense needs and education. If you would like to find out more about what we can do for a private, corporate or custom training event for you please contact our director of training at training@defenderoutdoors.com. 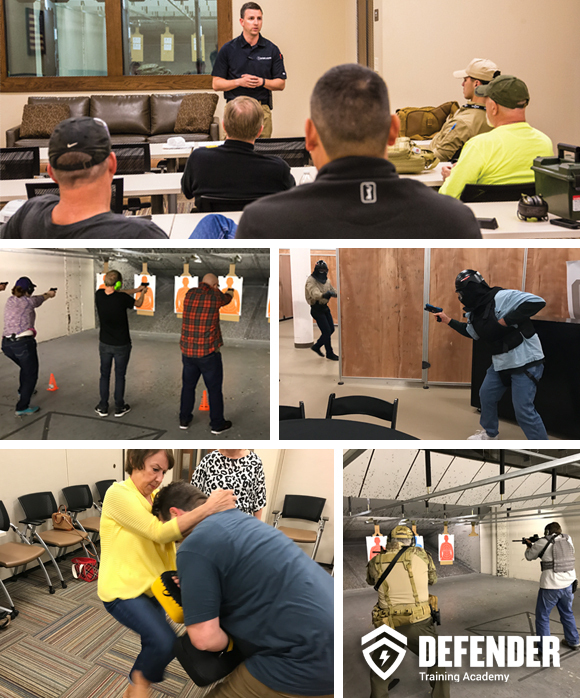 From active shooter training to situational awareness training Defender Training Academy can customize a training event or seminar for your office place. Below you will find just a sample of some of the corporate training we have done for others. If you are interested in any of these programs or working with our team to custom build a program for your needs just drop us an email at: training@defenderoutdoors.com.